The Gist: A man finds himself the target of a vampire looking for revenge after turning him into the police for being an art thief. 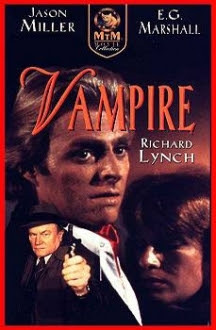 Clarification: This was a made for TV film in 1979 that is basically just a modern interpretation of the Dracula story but with slight changes and taking place in California revolving around two men hunting the vampire. Probably not so coincidentally the lead vampire hunter in the film is named John Rawlins which is more than likely in homage to vampire film director Jean Rollins. Female Vampire Factor: Not much in this film not to mention there are no vampire effects used so no makeup, eyes or fangs. The main protagonists wife Leslie (Kathryn Harrold) does get turned and he is tasked with killing her ala Lucy in Dracula mid-way through the film (her only scene as a vampire). Outside of that you've got nothing else in that category so I give it a Vampire Beauty Rating of 1 out of 5.